Many Chinese immigrants first arrived in Liverpool in the late 1850’s as a result of Alfred Holt and Company employed large number of Chinese seamen while establishing the Blue Funnel Shipping Line. This created strong trade links between the cities of Shanghai, Hong Kong and Liverpool; mainly importing silk, cotton and tea. 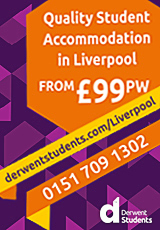 To accommodate their workers on shore leave in Liverpool, the shipping company opened boarding houses close to the docks where the men could stay with fellow countrymen, who spoke in their own language. Some Chinese sailors decided to jump ship and settled in an area of the city close to the docks around Cleveland Square, Pitt Street and Frederick Street. Gradually from the 1890s onwards, Chinese people began to set up their own shops, cafes and boarding houses to cater for the needs of the Chinese sailors. Some Chinese landlords exploited the situation and charged the illegal settlers higher rent than the going rate. One of the first Chinese shops opened was in Pitt Street. The Chinese seamen were well liked by the local women as they were seen to be hard working, did not often drink alcohol and took care of their families' welfare. Marriages between Chinese men and local women were beginning to take place in this period, though many Chinese men stayed single. At the beginning of the First World War, there was a large number of Chinese mariners in the city. During World War One, the Government borrowed ships from the Blue Funnel Line, some of which were destroyed or badly damaged. Whilst waiting for the next ship the seamen were compensated with vouchers worth £5, nicknamed the 'white duvet cover' due to its thickness. The time the Chinese sailors spent on shore leave in Liverpool could vary from two weeks to a month. As there was no entertainment for the seamen to spend their money on, they usually gathered in gambling establishments around the area. When gambling, the vouchers were used as chips with the value of each bet being estimated by measuring the thickness of the wad with a ruler. The Chinese settlers who were now established in the city, were concerned about the amount of seamen who were gambling away their wages, so in 1917, a 'Chinese Seaman's Welfare Centre' was opened in Bedford Street. This provided a place for them to gather, socialise and divert their attention away from the gambling dens. After World War One the Chinese population in Liverpool began to spread slowly inland to Cornwallis Street, Dickenson Street, Kent Street and Greetham Street. By now there were around fourteen different Chinese owned businesses in Pitt Street where you could either eat or buy Chinese food. Many Chinese men and their caucasian wives set up laundry business around the city. During the 1930’s, the council planned to replace all the decaying dwellings and warehouses in the area known as 'Chinatown'. The decay was due to economic depression of the time and the consequent recession in the shipping business, which caused the increase number of seamen who jumped ship. But during World War II, German bombers had destroyed Pitt Street, Cleveland Square and Frederick Street, causing the Chinese settlers to move further inland to Nelson Street, Great George Street, Upper Parliament Street, Duke Street and Berry Street. 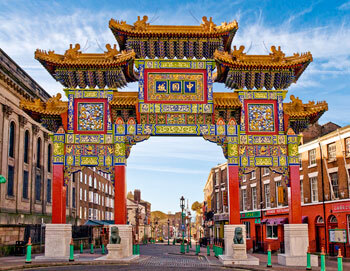 In year 2000, a Chinese Ceremonial Archway in Liverpool Chinatown was constructed at the top of Nelson Street. It became a local landmark and a tourist attraction. The structure was imported piece by piece from Shanghai, and then reconstructed by craftsmen from China. There are 200 dragons on the wooden and marble structure with a mixture of stunning gold, red, green and the Chinese Royal colour of yellow. The archway stands at 15m high, which is the largest in Europe. According to Feng Shui experts, it will protect Chinatown from evil, and bring good luck and fortune to the area. Today, Chinatown is still centred on Nelson Street, Duke Street and Berry Street area, where many community associations, Chinese gospel church, restaurants, supermarkets, book shops, etc are based. January, 2006, a commemorative plaque dedicated to the memory of Chinese seamen who had served in British merchant fleet during the first and second World War was unveiled about half a century too late, thanks to the persistent efforts of a group calling themselves "Dragons of the Pool" -- children of the Chinese seamen who had married local British women during the war years. This piece of history is indeed largely unknown not only to the British but also to the Chinese. 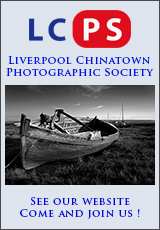 Liverpool saw the first Chinese merchant sailors in 1850s, when the then Alfred Holt & Co. established its shipping line from Shanghai to Liverpool and recruited Chinese sailors, making the China Town in Liverpool Europe's oldest. During the Second World War, according to the book "Friendship Arch A celebration of Liverpool and Shanghai", compiled by Cities 500 International Publishers, Liverpool became the headquarters of the Western Approaches that monitored the Atlantic, guarding the crucial lifelines on the sea. After years of arduous warfare and lost ships and crews, the British merchant navy started recruiting sailors from its allies across the world and Liverpool thus was turned into a reserve pool for Chinese merchant sailors, with up to 20,000 registered sailors at one point coming from China's Shanghai, Ningbo, Shandong, Hong Kong and Singapore. Thousands of the Chinese sailors lost their lives to the Atlantic during attacks from German submarines and as part of the British fleet; the Chinese sailors played an important role to Britain's victory in the war. After the war, however, due to the ongoing fights on the domestic front between China and Japan, the Chinese sailors could not be repatriated as stipulated in their two-year contract and had to stay on shore in Liverpool to scrape a living with the pitiful Chinese-standard salary. About 300 sailors married or cohabited with local girls, giving births to about 900 Eurasian children. In September 1945, however, as documents from the Public Record Office in Kew indicated, the British government started the repatriation. Although most of the sailors were willing to return to China, some who had families in Liverpool were not given an opportunity to stay as the law prescribed. More than 200 were forcefully repatriated in a two-day period leaving behind devastated wives and children believing they were abandoned. It was not until 2002 when the British Broadcasting Corporation ran a documentary program on the repatriation incident did it occur to the dragons and their families that they were by no means deserted by the sailors. "Giving respect to my ancestors is very important to me. You can't know you where you are going until you know where you come. Knowing the truth is a very positive thing for me. It changed the whole psyche. I'm very proud to be Chinese and British," said Barbara, one of the dragons who flied all the way from Canada to attend the event. "To the Chinese Merchant Seaman who served this country well during both World Wars. For those who gave their lives to this country - thank you. 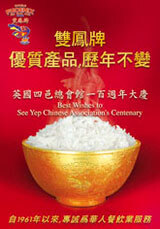 To the many Chinese Merchant Seamen who after both World Wars were required to leave. For their wives and partners who were left in ignorance of what happened to their men. For the children who never knew their fathers. This is a small reminder of what took place. We hope nothing like it will ever happen again. For your Memory. " In between the Chinese and English verses is "peace" in larger Chinese version. The dark-marble plaque placed on the wall faces out into the sea while not far behind it, is the India Building which used to house the Alfred Holt & Co., employer of the Chinese sailors during the war times. "Isn't it beautiful?" asked Val, a "dragon" who is lucky enough to have her dad's photo and his letter to her mom shortly after his repatriation. "It's stunning," marveled Barbara, caressing the words on the plaque, tears streaming out helplessly. Up to now, Barbara doesn't know where her dad was from although she happened to keep a wedding photo of her dad's brother. "I will not rest until I find the truth," she said. Yvonne Foley, leader of the group, has known from the pieces of information from her mom that her dad was from the French quarter in Shanghai, but like the others has nothing left written in Chinese, which makes the search extremely difficult. "I can't shut up about the great injustice done to our fathers. Today we dedicate a memorial to all of them and to an event that has affected the lives of so many of us here," she added. To the dozens "Dragons of the Pool" and their family, the plaque is, as Yvonne put it, "a reward and sadness", for when they just started to know about their fathers, most of them have passed away. "We are now all in our 60s. We don't want the history to slip away, nor do we want our children and grandchildren to forget it," she said. Starting from last March, Yvonne and her husband Charles have been doing research on the history of Chinese sailors in Britain, before exchanging information with other "dragons". "Most of the files had been destroyed in the war or by other natural disasters. What we are now doing is to piece together the history and hopefully put it in a book when time is ripe," said Yvonne. Commemorative plaque laid at Pier Head, Liverpool in 2006 to mark the recognition of forced deportation and repatriation of Chinese seamen after the Second World War. Read Yvonne Foley's website.